Three years ago marked my first visit to Carowinds, a trip made with extended family during which we checked off all of the coasters in the park at that time. Since then there has been one new addition, a coaster which has boldly gone where no coaster has gone before. Apologies for using the cliché, but in all honesty it was probably a benefit to society that nobody considered theming a ride around Star Trek until the recent installation of BORG Assimilator (#777). A brief disclaimer is obligatory for this paragraph; while I do watch Star Trek occasionally, it is not a regular thing and I do not profess to know the series well. Nevertheless, the idea of theming a flying coaster after the process of assimilation seems more than a little strange to me. There is no doubt that the location at the front of the park is striking, especially with the large Borg ship crashed into the water around it. However, surely it would have made more sense to use something from the series which does actually fly; perhaps the prototype rocket out of First Contact, which when accelerating to warp speed shook at least as much as this coaster. Therein lies the issue; the prototype Vekoma flying coaster relocated from California's Great America lacks the finesse of the later models. The principal difficulty is the constant side to side shuffling of the trains, almost like what one would expect on a wood coaster, and the sensation is not entirely pleasant in a face down position. It is not severe enough to limit rerideability, but the park will have to look after the ride carefully to ensure it continues to satisfy guests. Having said that, the ride is certainly a great addition to the park as a whole. 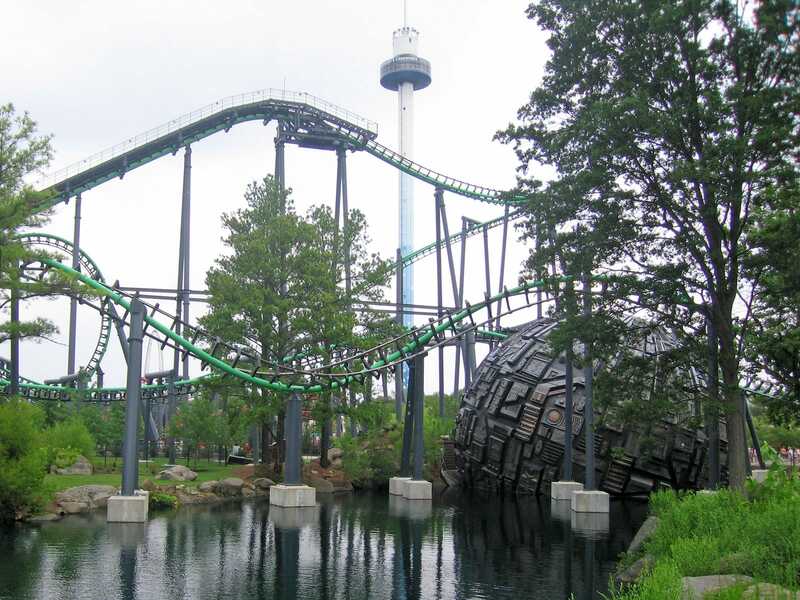 It had been more than five years since the installation of the last major coaster, and it is necessary to refresh attractions on a semi regular basis to keep guests coming through the gate. The local patrons seem to love it, which at the end of the day counts a great deal more than some jaded enthusiasts opinion. With the new coaster out of the way, it was time for me to accept what my stomach was telling me and take things a little easy. Being under the weather while on holiday is extremely frustrating, and as much as possible I try to work on the basis that I'm going to have fun whether I like it or not! Nevertheless, it seemed like a sensible plan to sit down for a while while George got his credit on Flying Super Saturator. This gave me long enough to recover, a process assisted somewhat by a plate of vegetables I managed to procure from elsewhere in the park. It is good to see the trains on Thunder Road being raced like they should be. The backward facing side appears to have been recently retracked, and to that end it was running very well. The same could not be said about the forward facing side, which is in serious need of track work. Hopefully this will be performed in the off season. Recorded announcements in ride stations are as a general rule unnecessary. A far better plan involves putting up a sign with the pertinent information either on the back wall of the station or in front of the loading area. If you insist on being friendly to those locals who cannot read, however, it might make sense to set the volume to a level where guests can hear it. Crucially, however, it should not be set so loud as to distort the sound. It is not always possible to understand English spoken in a Spanish accent marred by distortion and positive feedback. Repeating the same tape on loop under the above conditions only serves to give oncoming riders a splitting headache. The worst offender today was the Fairly Odd Coaster station but it was not the only one by any means. Could someone please explain to me why it is necessary for riders to take two steps back from the closed safety gates when a coaster train pulls into the station at five miles per hour? The gate design on the ride in question left more than enough room between oncoming passengers and the train to prevent any incidents. If it is really that much of an issue then why not just move the gates back a little further? The best coaster in the park remains the B&M masterpiece, Top Gun. The ride has been refitted this year with an on-ride DVD recording system. This seems to be the current trend, as we saw it in quite a few more parks during the course of our trip. The idea seems more than a little odd to me; an on-ride photo is one thing, but a video seems superfluous; why would anyone want to watch ninety seconds of themselves screaming? One final note for the day is that our scheduled drive was too long. It took us more than four hours to drive from Carowinds up to our hotel in Richmond, not including stops, and this was utterly exhausting. Though not the longest drive on the trip it seems that both of us were still dealing with the after effects of jet lag, which made the time go even more slowly. Long drives are not necessarily a problem, but putting one after a large park on only the third day of the trip was a mistake.